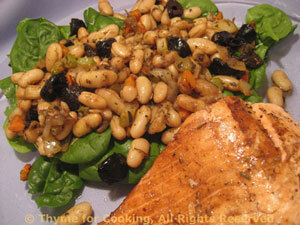 Pan-Fried Salmon,h Warm White Bean Salad, Thyme for Cooking easy main course. Salmon cooks quickly and is done when just barely opaque, and starts to flake easily. Heat the oil and vinegar over medium heat in a large skillet. Add salmon, skin side up, and sauté 3 minutes. Turn, skin side down, and sauté another 3 - 5 minutes, until done. Slip the salmon off the skin and serve. Roughly chop the shallots, carrot and celery. You should have about 1/3 cup of each. In a medium skillet over medium heat, sauté the carrot, celery, shallots and garlic in olive oil until tender, 5 - 8 minutes. Pit olives if needed; cut in half. Add olives, beans, basil and vinegar to skillet. Heat through. Serve salad on a bed of spinach, next to the salmon.